We’re keeping the snowmelt theme here on the Able blog for another week. Last week, Fernox’s Alphi-11 Antifreeze Protector was the focal point. 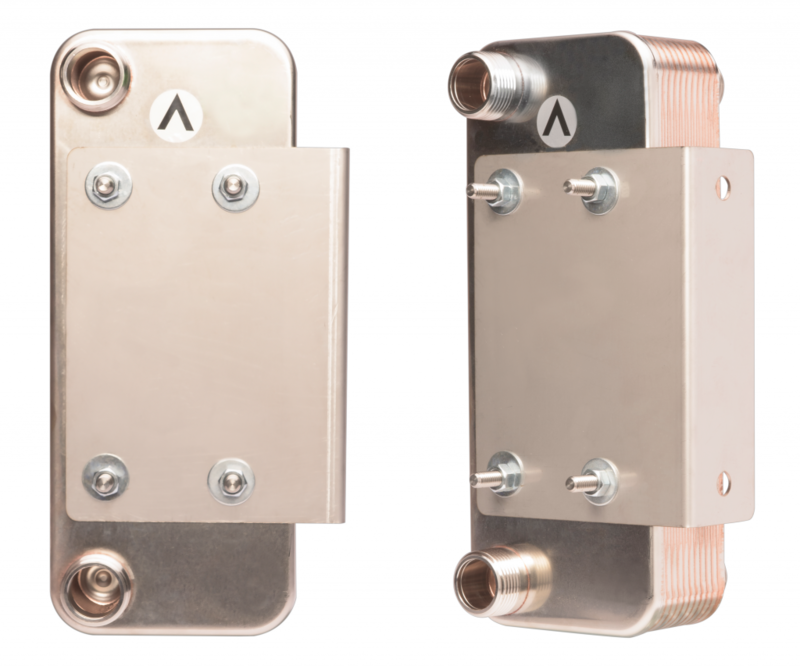 This week, we’re pivoting to brazed plate heat exchangers by SWEP. SWEP is a Swedish company that has been designing and refining heat exchangers for more than three decades. Their expertise caught the eye of Dover, a 7 billion/year company, and now SWEP’s heat exchangers are available in fifty different countries. Flat plate heat exchangers can be a real pain point for hydronic contractors. They’re a necessity in snowmelt systems and applications that pose a freezing risk, so you can’t just ignore them, but installation is typically a nuisance at best and a nightmare at worst. From mounting issues to poorly placed connections, getting a heat exchanger installed in a system with multiple fluids/media can be a real bear. That’s why we’re so excited about SWEP’s B10 stainless steel brazed plate heat exchangers. These products take a miserable experience and flip the script. A major element of SWEP’s success has been their flexibility. They developed a set of high-quality standard components which they can use to create custom solutions for different applications. This flexibility led to the development of the B10 heat exchanger which features the most convenient flat plate design that we have ever seen. The B10 flat plate heat exchanger design features custom split piping connections. Two system connections on one side, two boiler connections on the other side. All four connections are 1″ NPT; it really doesn’t get any easier than that. Additionally, SWEP manufactures an affordable bracket for the B10 line, allowing you to mount it easily on the wall–or a sheet of diamond plate! Able has two sizes of B10 heat exchanger available for order: an 8-plate model and a 12-plate model. The 8-plate version has a capacity of 60,000 BTU and it is suitable for snowmelt applications of 500 to 600 square feet. The 12-plate model supports 110,000 BTU for applications up to 900 to 1,100 square feet. These units are made of stainless steel and UL-listed. This year, we’ve added a lot of products that are designed to make hydronic jobs easier. From Calefactio accessories to new Fernox treatments to diamond plate for the equipment room walls, we’ve expanded our catalog to make your life easier and SWEP’s brazed plate heat exchangers are just another example of our dedication to making your life easier.